These books were family staples for most Baby Boomers, but are frequently overlooked when rediscovering artifacts from our youth. 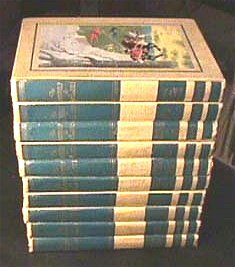 number 8 - Bookland Classics and you're off to see the Wizard. could read about Ben Franklin, learn how to scramble eggs or get lost in Through the Looking Glass. The black and white and color photographs and illustrations were plentiful and beautiful. to an encyclopedia package. Each set of box included a Parents Guide for helping children with the books. know this because I have, I believe, one of the only remaining 21 volume sets. coming apart in some cases, but overall still very beautiful and appealing.